The handmade C12 features the vintage elegance of a hand-inlaid mother-of-pearl rosette inspired by a 1920's Domingo Esteso design and a beautiful flamed maple wedge on its solid Indian rosewood back. Modern design elements also include a lattice braced top and raised fingerboard for easy playability when accessing upper frets. This model has a solid European spruce with Indian rosewood back and sides. Other notable features of the C12 include its black-and-gold tuning machines, ebony fingerboard and adjustable truss rod. The guitar has exceptionally pure tone--the trebles are sweet and buttery with good projection. The basses are articulate and rich. The instrument has an amazingly broad dynamic range. It can produce extreme volume and wonderful projection. The C12 belies its (relatively) modest price. I will use this guitar for full recitals! The construction appears very solid (although the instrument is not heavy.) All joints and seams are perfectly executed. If this guitar holds up as well as my students' C5's, it should last forever. I purchased this guitar through Custom Guitar's Friend and got a very nice deal when I called their "Where's the coupons?" phone number. The instrument would be a wonderful bargain at full list price -- which I did not pay!!! An incredible value! I was very happily anticipating receiving this Cordoba C12 SP/IN. It did not disappoint. One of my students bought one and had brought it to his lesson. He is one of those people blessed with wonderful tone-sense, but I was amazed how much better his tone had become in the week since his last lesson. Then I realized it wasn't his old guitar I was hearing. At first I thought it was a Cordoba C10 which is a very nice guitar for the money and can hold its own against many a pricier guitar. Then I noticed the slightly raised fingerboard and the flashier maple bits on the body. I had to put this student's guitar through her paces. It is a very nicely built instrument, resonant and very responsive. For a guitar that had a minimum number of playing hours on it, it sounded almost as mature as my 2004 Kenny Hill Munich '37. That is high praise. Over the coming weeks, his guitar has improved! I have a distinct feeling that the C12 benefitted from the collaboration/consultation work Mr. Hill has done with/for Cordoba. It feels and sounds like a Hill, and that is a very good thing indeed. Not every gig requires me to bring an irreplaceable guitar. In fact, for wedding cocktail hours I have been using a Yamaha SLG 150NW through a Bose L-1. If someone were to sit on the Yamaha, it would probably not even be knocked out of tune. I am not saying I will risk harm to my Cordoba C12—it will never go to a wedding cocktail hour— but I will feel a little less edgy bringing it into new performance situations. And I will sound superb! This may be the ideal dinner party guitar. I take that back—I'll use it for recitals! 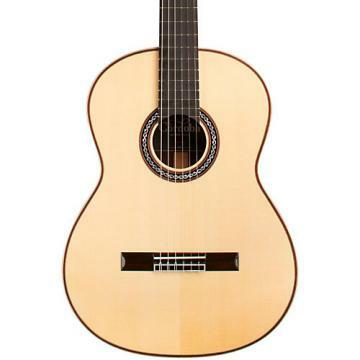 I have recommended Cordoba's C5 model to newer students over the years and haves always been impressed with the build quality and sound of these instruments. As the numbers go from 5 to 12, the instruments just seem to get better and better—no plateaus. So, with all that said, when I felt it was time to finally 'retire' my trusty Munich '37, the C12 appeared to be an excellent replacement. I spoke with my always courteous and helpful sales rep at Custom Guitars Friend and got a great deal on a C12. It arrived on time—as promised—and in immaculate condition. Over the first day, I played my new C12 for about four hours. In day two I did likewise. It sounds better every time I take her out of the case. Fit and finish are impeccable. The Savarez Corum high tension strings that came installed are excellent both in aural as well as the tactile sense and I will probably continue to use them although my 'house string' is the Savarez Cantiga set. The action and intonation are just fine and the dynamic range of the instrument is astounding. A case is included and it is just fine for anything but serious travel and is equipped with an in-case humidifier. Overall, you will not go wrong purchasing a Cordoba C12. I would have paid more, but making this purchase from Custom Guitar's Friend, I know I got a great deal. A lovely instrument!